Kauai is Hawaii's fourth largest island. The oldest and northernmost, Kauai is known as the “Garden Island”. Draped in emerald valleys, jagged cliffs and cascading waterfalls, Kauai gets its name from tropical rainforests covering most of its surface. Tourists visit Kauai mostly to explore its stunning features and memorable attractions, and if you are truly passionate about nature, this island was made for you. Some parts of Kauai are accessible only by sea or air revealing the most spectacular views beyond your imagination. Kayak through the famous Wailua River, snorkel on the heavenly Poipu beach or hike through Kokee State Park, either way, here, on Kauai you will experience the undeniable allure of the island. Kauai population grows, but much slower than on its neighboring sister islands. According to an approximate estimation, Kauai's population in 2017 was 68,000 residents. East side of Kauai, also known as Royal Coconut Coast, is the most populated area among other towns and villages on the island. 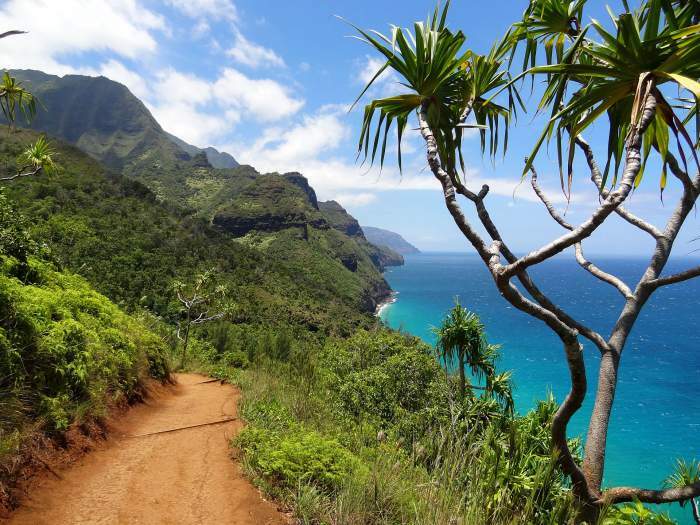 Most Kauaian residents live here, where among the clusters of gorgeously swaying palm trees, you will also find a number of historical places, pristine beaches and attractions you would not want to miss. There are many regions in Kauai that make this truly incredible island whole. Each one of those regions is undeniably unique offering its visitors the best the nature can give. North Shore is by far one of the most visited sites in Kauai. North Shore is an enchanting setting of rugged mountains, full of lush vegetation fields, spectacular cliffs and pristine beaches, a place everyone wants to call home. Although packed with amazing world wonders, Kauai has something the other islands do not. 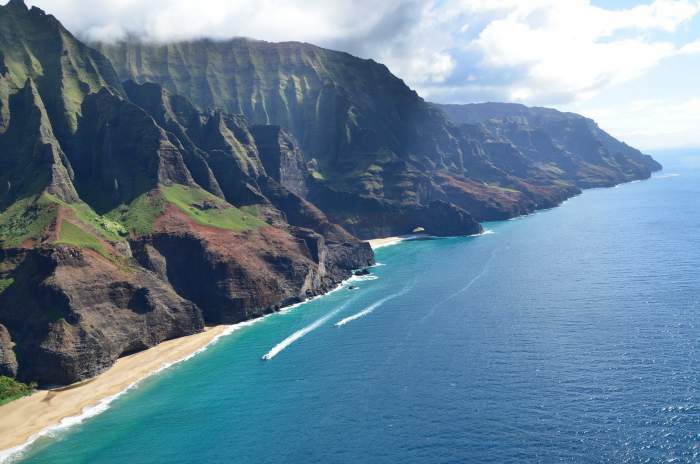 Its magnificent Napali Coast is a 17-mile stretch coastline that is lined with 3,000-foot (914 meters) tall cliffs surrounded by lush green valleys and the most splendid waterfalls. This local gem is not accessible by car, but you can always hike or take an air or boat tour. There are so many amazing things to do on Kauai. Choose your favorite activity and spend your day fully engaging in the fun adventures or book a couple of outings and come to your hotel suite with a few stories to tell. Snorkeling and sailing is sure to be a lot of fun, so pack your snorkeling gear or rent one on the beach and fully enjoy the ocean life beneath. Combine a sightseeing tour along with hiking and horseback riding. An active day like that will sure wear you out but will leave a positive footprint in your heart. Visit the Silver Horse Ranch for a variety of horseback excursions in the fields of vast natural landscapes. Luaus are extremely important to the Hawaiian culture. Luaus are carefully planned ahead, special costumes are carefully sewed and artists fully prepare for nights of entertainment, dancing and tasting delicious local foods. Aside from the best things to do, Kauai has its own not-to-miss attractions. Huleia National Wildlife Refuge, Mt. Waialeale, Princeville Botanical Gardens, Queen's Bath and Kamokila Hawaiian Village are just a few of the local landmarks waiting to be explored. Kauai is smaller than other Hawaiian islands, but the abundance of waterfalls in the area is amazing. Opaekaa Falls, Hanakapiai Falls, Ho'opi'i Falls and Manawaiopuna Falls are among the most picturesque waterfalls in Kauai. Most of them are secluded and are never crowded, so you might spend the moment to enjoy listening to the bubbling waters of the falls and the singing of the birds. East Side (Coconut Coast) of Kauai is as mesmerizing and appealing as the North Shore and contains two major towns Wailua and Kapaa. Many of Kauai's accommodations are situated in this area as well as many popular restaurants, cafes, shops, hiking and biking trails. One of the most prominent mountains on Kauai, Nounou Mountain (also known as the “Sleeping Giant”) is also located here, in the Royal Coconut Coast. It is located on the north side of Wailua River and has several pretty amazing hiking trails. The most popular beach in Royal Coconut Coast is called Lydgate Beach Park. It is located on the south side of Wailua river and is ideal for family beach outings. It has a fabulous salt-water pool created by lava rock wall in the ocean and separated into two sections. Normally the smaller pool area is used by parents with small children while the bigger pool is perfect for swimming and even snorkeling. Wailua Bay or Wailua Beach is another fascinating beach; however, it is not suggested for swimming. If you enjoy walking through the shores gently soaking up your feet in the breaking waves, then this beach is for you. It is a brief stretch of beach north to the Wailua River that ends at the rocky point to the north. This beach is great for walking and admiring the local surroundings, but it is not recommended for swimming or engaging in other water activities. Some of the highlights of the Royal Coconut Coast are Opaekaa Falls, Wailua River and Fern Grotto, a fern-filled cave that requires a boat ride to be reached. Lihue, the island's government and commercial center serves as cultural and historical area. This is the most visited town in Kauai since the island's airport is located here. The highlights of this truly amazing place is Wailua Falls, the 80-foot high waterfalls located to the north of Lihue, a Kilohana Estate, a restored plantation estate and the Kauia Museum, where unique collections from the artisans of Kauai and Niihau are carefully stored. Lihue is also a popular destination for your favorite water sports such as surfing and diving and Kalapaki Beach is just for that. Ninini Beach although not great for swimming serves as a great tourist attraction because of the 1897 lighthouse located on its premises. Lihue also has a number of historical landmarks that every guest should explore. Alekoko Fishpond, that is 1,000 years old, serves as a reservoir and Grove Farm Homestead Museum are among frequently visited sites. Dive through the beautiful bushes and luscious trees to find yourself on the South Shore of Kauai. South Shore is another region within the island, that is home to the Spouting Horn, a one-of-a-kind attraction of a blowhole that releases a spout of water up to almost 6 meters (20 feet) into the air. When you arrive at the South Shore, you will have a great opportunity to stroll through the streets of this small but charming region. Trust us, you will never get bored when you stay in South Shore. Packed with boutiques, fine dining, golf courses, beaches and quite a few things to see, there is never a dull moment and you will always be occupied. For those that would take the first opportunity to indulge in the beach, choose one of the popular beaches located around the Poipu area. These fabulously smooth coastlines of sand and calm crystal-clear waters will definitely make your nap on the beach sweet and long. But if you are exploring the history, then visit Koloa Heritage Trail that spotlights some of the best cultural and geological sites in the area. Old Kaloa Town is also a must-see area that has a vast plantation history. You will be delighted once you find yourself in the Allerton Garden that is home to gigantic figs (remember the movie "Jurassic Park"?). This garden also possesses very cool hiking trails and an opportunity to see some of the rare plant species. Another region within Kauai is West Side, that is located about 1 hour drive from Lihue. Once you see the local natural wonders and the spectacular sites, you will feel you are a world away. Its funky small towns will give you a glimpse of what the life in the West Side is really like. 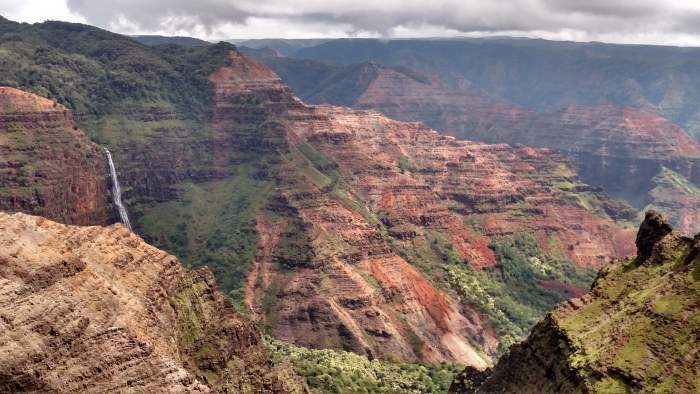 The most prominent attraction in the West Side is the Waimea Canyon, also known as “Grand Canyon of the Pacific”. Packed with scenic hiking trails and plunging valleys dipping more than 1,097 meters (3,600 feet) into the Earth, there is nothing quite like it. The Kokee State Park nearby offer endless hiking trails and an opportunity to learn more about the local wildlife. Waimea and Hanapepe are two of the local towns in the West Side that definitely need a visit. Waimea, a site for historical learning has statues and monuments of famous people who discovered parts of Hawaii. Further to Hanapepe town, about 11 km (7 miles) south of Waimea, you will discover eclectic galleries, souvenir shops and mouthwatering eateries, a place definitely worth a look! However, the golden beaches of Kauai is the island's biggest draw. Hanalei Bay, Makua Beach, Anini Beach, Polihale State Park, Hapuna Beach or Tunnels Beach all located are among the most popular beaches with azure waters and sparkling white sands. Visitors have amazing opportunities not only to enjoy the local weather but also engage in some of the cool water sports. A number of beaches are located close to resort and hotel areas; however, those that are situated further away are frequented by the local residents as well, which gives you a chance to make some new friends. Just like for other Hawaiian islands, the only way to get to Kauai is by air. If you are planning on travelling here, you would have to travel to Honolulu's International Airport and take a domestic flight from there on. Domestic flights between Hawaiian islands are offered on a daily basis with frequent scheduled times. If you are a European resident travelling to Kauai, you would have to land in one of the major U.S. cities and take a transfer flight from there in order to arrive in Kauai. Several airline companies now offer nonstop flights from Los Angeles, Oakland, Seattle, Vancouver (Canada) and others, so you can travel directly to Kauai without the need of a transfer in Honolulu. Toronto does not fly nonstop to Kauai, so if you are planning your trip to the island, plan for a connection somewhere in the United States. Accommodations on Kauai range from luxury to budget-friendly, making this magnificent island accessible to guest of all preferences and budgets. North Shore is exactly where you can indulge in world-class hospitality while enjoying some of the best amenities around. And if you are a golfer of any level, Kauai also offers premier golf courses giving its guests a great opportunity to excel further in the sport. Family-friendly hotels are all tossed along the shores of the ocean offering excellent service, superb entertainment and fine dining. Other accommodations ranging from historic bed and breakfast stays, small cozy inns or even rental homes are also available to those that do not want to spend an arm and a leg on lodging while still getting a good night's sleep. No matter where you will be spending your first night after your arrival in Kauai, it is guaranteed to be enjoyable! Anywhere you go on Kauai, you will always find that it is the island's laid-back atmosphere, rich culture and traditions that make this place truly timeless.